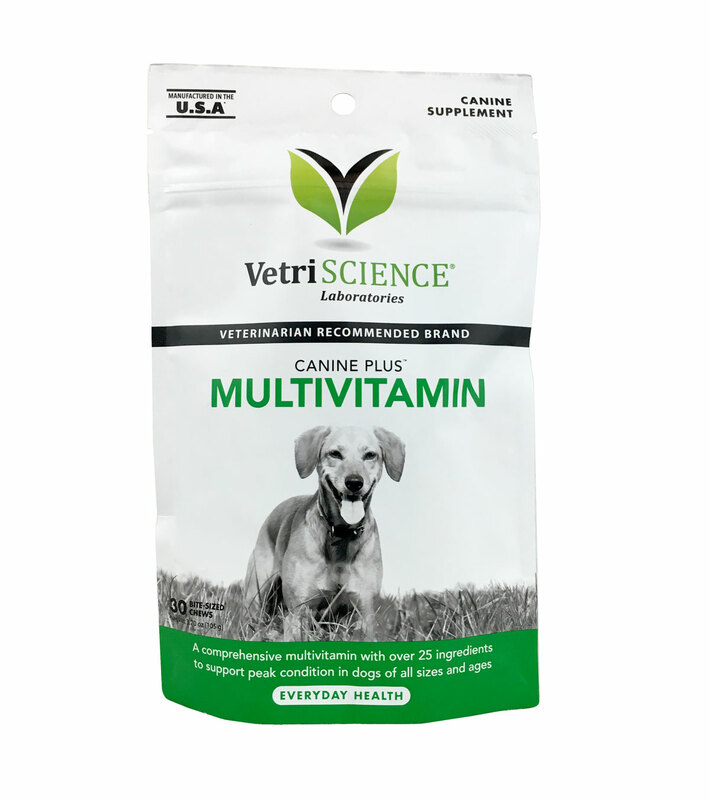 VetriScience® Laboratories’ Canine Plus Multivitamin is a complete, chewable multivitamin for your dog. VetriScience® Laboratories’ Canine Plus Multivitamin is a complete, chewable multivitamin for your dog. Specifically formulated with a balance of amino acids, vitamins, minerals, fatty acids, antioxidants and other factors, Canine Plus Multivitamin chews are designed to help maintain the overall physical well-being of your dog, no matter his size, age or breed. Includes fish oil omegas and B vitamins! Feeding Directions: Under 30 lbs: 1/2 chew daily. 30 - 60 lbs: 1 chew daily. Over 60 lbs: 2 chews daily. Ingredients: oat flour, brewers dried yeast, glycerin, rye flour, calcium phosphate, arabic gum, vegetable flavor, calcium carbonate, canola oil, soy lecithin, fish oil concentrate, l-ascorbyl-2-polyhosphate, maltodextrin, sodium alginate, calcium sulfate, citrus pectin, water, vitamin E supplement, dl-methionine, vitamin B12 supplement, ferrous sulfate, sorbic acid (a preservative), zinc sulfate, niacinamide, d-calcium pantothenate, mixed tocopherols (a preservative), propionic acid (a preservative), manganese sulfate, inositol, riboflavin, copper sulfate, magnesium oxide, vitamin D supplement, vitamin A supplement, pyridoxine hydrochloride, sodium selenite, thiamine mononitrate, biotin, folic acid, potassium chloride, calcium iodate.